Subscription Video-on-Demand (SVoD) is an entertainment programming model where users pay a monthly fee in exchange for instant access to a streaming library consisting of movies, TV shows, and other media content. Since around 2006, companies like Netflix, Hulu, and Amazon have taken advantage of this new system of media consumption and used the technology to grow their brands into some of the biggest names in the entertainment industry. The demand for their services is only expected to increase from here, with worldwide digital video revenue expected to grow in the coming years and SVoD accounting for a larger percentage each year. Additionally, the number of SVoD users worldwide is expected to skyrocket from around 283 million in 2018 to 411 million in 2022. Younger generations are the ones driving demand the most, with 18-24 year olds spending an average of 39 minutes per day using some sort of SVoD service. As the market has matured, SVoD providers have quickly realized the importance of adding their own original programming to their content library. In 2017 alone, Amazon produced 56 original content titles, amounting to 285 hours of original content. In the same year, Netflix produced 300 original titles, and a total of around 1257 hours of original content. However, the race to create and distribute more original shows does not seem to be rooted in a ‘quantity over quality’ mentality – despite the obvious competition in the industry. With programs such as Stranger Things (Netflix), The Handmaid’s Tale (Hulu), and The Marvelous Mrs. Maisel (Amazon), these companies are showing that they aren’t satisfied with simply generating more content for their viewers; they want recognition for their efforts. At the 2018 edition of the Primetime Emmy Awards, Netflix collected 23 awards, tying for the most of any network. In addition to the wealth of high quality original content, these SVoD services also provide subscribers with access to ever-growing libraries of movies and acquired TV network series. Considering the massive amount of content being provided at the touch of a button, one of the most important factors for the success of SVoD is surely its price point. With many options available for less than 15 dollars per month, it is clear why people are beginning to leave their cable subscription behind. 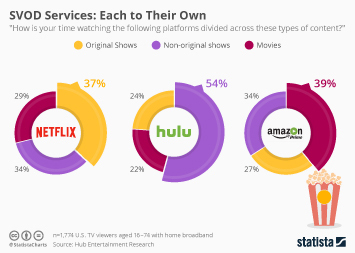 Netflix and Hulu have the highest ‘value for money’ ratings of any video entertainment platform, making it easy to understand why SVoD is seeing so much success. As consumers continue to ‘cut cords’, traditional forms of media access such as cable and satellite will find it harder and harder to compete with the growing influence of SVoD. Bolstered by both the strength of the technology itself and the success of the individual companies competing in the market, the SVoD industry appears to be set for years of continued success. Topic: Home video market in the U.S.